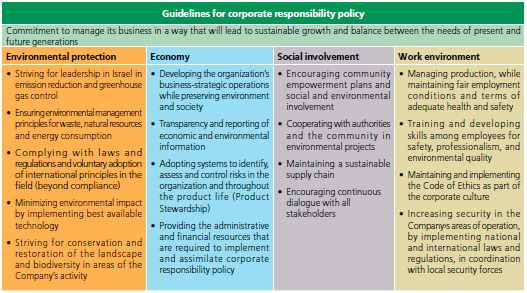 Our management takes concrete steps to apply our policies of corporate responsibility. The Boards of our segments in Israel have appointed committees to oversee issues related to environment, safety, hygiene and security, and support their activities through the use of external consultants. In addition, our management has established enforcement and monitoring programs to ensure full compliance with the law. ICL’s Executive Vice President and Chief Operating Officer, Asher Grinbaum, serves as ICL’s Chief Risk Manager with responsibility for the environmental, safety, occupational health and security issues facing our Company.